I wore my Peggy Lutz Green Slither Juliet Dress: On the red Carpet when George was awarded Time’s 100 Most Influential People in the World Awards in NYC. Looks like I wIll be needing a new dress…. The Emmy nominations came out this morning, and ‘Game Of Thrones’ received 13 nominations in all, a remarkable feat for first year show, let alone a fantasy series, which, like Sci-Fi shows usually only gets technical awards nominations from the Television Academy and the Oscars. Since GoT was nominated for Best Dramatic series, George, as an executive producer, is a nominee, and we’ll have the Golden ticket to walk down the red carpet! 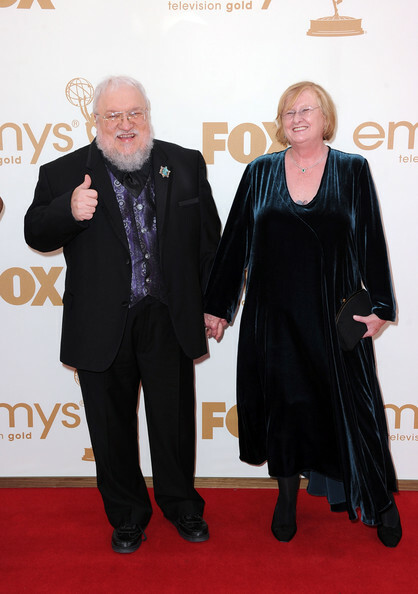 Although Game of Thrones was nominated for 13 Emmy Awards in mid-July, that final, Golden Invitation to walk the red carpet arrived only 10 days before the event. With Parris’ measurements on file, we cooked up the simple, elegant, deep teal silk velvet Curved Dress she’d chosen in record time and Parris loved it. “I received so many compliments on my outfit and it was so comfortable and elegant to wear that night. Thank you for all of the wonderful service and positive energy you gave to this project, I love this gown and will be wearing it as often as I can. Again, thank you for creating such a beautiful, elegant and comfortable gown in such a short period of time. The quality of the construction and fabric ensures that I’ll be able to wear it even 10 years from now. You do great work and I’ll be passing on your company’s website address to other women. My friends know how much I struggle to find appropriate clothing for high-end events, and when they ask who made my dress – I will tell them Peggy Lutz!